You may not realize this, but fear is big business. Yes, companies have found ways to monetize fear. And not only companies, but governments; and news organizations. Stories and events that lead us to be afraid have a funny way of grabbing our attention. We are captivated. We turn up the volume and tell everyone in the room to be quiet. We click on the link. We write messages on social media about fearful stories more than we do uplifting and positive stories. For example, you can read this story from CBS News that shows how social media has blown Ebola fears out of proportion. It's nothing new; but recently the fear mongering has caught my attention again. ISIS, Ebola, H5N1 (bird flu), malaria, Syrian nukes, and lots of other things are floating around out there, just waiting to make people afraid so they will subscribe to e-mail newsletters. Yes, there are disturbing things happening in the world. In fact, I follow several of the above listed issues--not closely, but enough to know basically what's happening. But I want to be clear about my stance on fear--it's bad. I will not fear ISIS, or Sharia law, or the Taliban, or political activists, or pathogenic outbreaks, or tornadoes. And this list is just scratching the surface! There are TONS of things to be afraid of, if that is your disposition. Some of you are thinking, "I don't buy fear. They don't even sell it at Wal-Mart!" We may not spend our money on it or order bottles of fear from Amazon, but often we spend our time, our energy, and our attention on fear. We worry about what might happen or the way events are unfolding. Why do I think fear is bad? I just did a search on BibleGateway.com. I looked for the phrase "fear not" in the KJV (King James Version) Bible. "Be not afraid" was found sixty-three times. "Do not fear" was found thirty-seven times. As a Christian, fear is not only an insult to a omnipotent God, but it is a toxic poison that taints the goals of our lives. We were not put on this planet to survive like zebra running from lions--hiding in the rocks and trees to avoid being dismembered. We have a positive purpose on this Earth, and that purpose is not to be afraid of what is happening, what has happened, or what will happen. It's just not worth your most valuable asset--time. "Okay, so we should be care-free and stick our heads in the sand?" I am concerned about many things. I care deeply about many issues. I am actively involved in changing the world (I hope). But nowhere in that activity do I find room to be afraid. It's just not part of the formula. Not only is fear a waste of time, it is destructive. It paralyzes us. It fixates our minds away from the tasks and duties we have been given. It distracts us from more important things, like love, kindness, generosity, education, wisdom, and the pursuit of knowledge. This is a trick question. 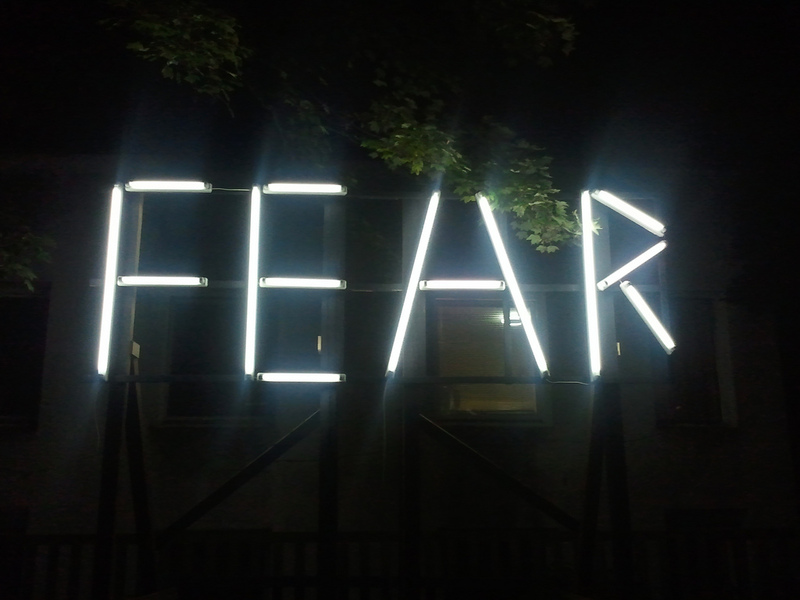 Let it be sufficient to say that fear has a beneficial place in changing behavior. Should I fear car accidents? Yes, insomuch that it causes me to drive more safely. Should I fear obesity/diabetes type II/heart disease? Yes, insomuch that it causes me to establish a healthy diet. Should I fear 220 V electrical current in my house? Yes, insomuch that it causes me to use proper safety precautions when tinkering with a circuit. Should I fear whether Mahmoud Ahmadeinejad or Vladmir Putin or Kim Jong-un is going to enforce global slavery and destroy peace and freedom in the world? No. Because global affairs are not something I influence. I have no skin in the game. I can observe what happens, but my future is not in the hands of these tiny little men (in my opinion of what a man is). Should I fear a global pandemic that wipes out millions of people? No. Because the odds are not in its favor. And if (and that's a big "if") it did happen, it's out of my control; and my life will either continue or end (which could happen any day of my life, regardless of a pandemic). Should I fear global economic collapse? No. Once again, it's not in my control. If it happens, I will do my best to provide for my family and continue doing what I've always done--with less money. Should I fear Islamic militants coming into my homeland and beheading me? No. Because these itty-bitty, microscopically-sized men have no greater goal than to instill fear in people. If I am afraid for one second, that's too much victory for them. Proverbs 3:25-26 Be not afraid of sudden fear, neither of the desolation of the wicked, when it comes. For the LORD shall be thy confidence and shall keep thy food from being taken. II Corinthians 4:8-9 We are troubled on every side, yet not distressed; we are perplexed, but not in despair; persecuted, but not forsaken; cast down, but not destroyed.